Cheesy Chicken and Rice Burrito with Guacamole. We love cooking at The Unknown Cook. Cooking allows us to test the many great recipes we encounter and experiment with different tastes. We can also discover which items work well together and which ones don’t. For us, cooking is all about creativity and making a reality out of what we see in our minds and anticipate in our taste buds and putting it on a plate. Let’s call it an art why don’t we? From our imagination, we experimented last night with a Mexican styled dish in our own version of a Cheesy Chicken and Rice Burrito. This was a fun dish to create and really tasty too! It didn’t take much time to create this meal at all. Lucky for us, we had already prepared a couple of items the night before. For instance, we seasoned the chicken with our favorite spices before bed time. The rice was left over from the previous night’s dinner. (We always have left over rice because we eat so much of it.) Of course you can make your very own Cheesy Chicken and Rice Burritos. While our version isn’t authentic Mexican, we share the recipe below which is written for a serving of 4 hungry people. Hope you enjoy! Chicken, Rice and Peppers! Hmmm! If you are a well-prepared home kitchen master, you have probably written out your daily menu for the week. It will be easier if you are such a cook because your chicken and vegetable prep will already be done in advance of cooking this meal. If you aren’t that well prepared, it’s okay. It still won’t take long to get everything in order. I cooked my rice first. Remember, my rice was prepared the day before and we had left overs. If this is not the case for you, get your rice started now so that by the time you are ready to add it later on, it will have cooled down a bit. While your rice is cooking, dice your chicken breasts into bite-size pieces. I have seen some chicken for this type meal sliced as well as shredded. Dicing, slicing, or shredding is your preference. Set your chicken aside once you are done. I used my flat top grill to cook my diced chicken. Besides the fact that I just love cooking on this thing, I wanted to seal in as much of the flavor of the chicken as I could. This also allows for my bite-sized chicken to be tender. My flat top does that for me. If you elect to use this type grill, prepare the surface with 2-tbsp of olive oil and bring the temperature to 375 degrees. Once the surface temperature is reached, place the chicken on the grill. There will be a few things going on at once so be expedient. Next, you want to slice your bell pepper and onion. As you can see from the picture above, I used red, yellow and green peppers. Of course, that was my preference. You may elect to use one or more colors for your dish. Once done with slicing your pepper and onion, you will want to coarsely chop your parsley. In your favorite skillet, most likely the one you will do the entire mix in, add 2-Tbsp of olive oil and heat at a medium temperature. Once the oil has reached temperature, put in your peppers. Once the peppers are in, check your rice. It should be close to being done now. If so, turn it off and remove from the burner for use in a few minutes. Check on your chicken. It should be sizzling right along. Turn it if necessary. Cheesy Chicken and Rice Burrito Split! When your peppers become limp and more vibrant in color, add in your onions. Let the onion and pepper mix sizzle for a few minutes. Add in the 1/2-Tsp of crushed red pepper and mix thoroughly with the peppers and onions. For more of a zing, you can increase this to your preference. I didn’t let the onions cook to transparency as I wanted a little crunchiness in the peppers and onions when wrapping them up into my burritos. This, again, is preference. You may cook yours to preference. Don’t forget about your chicken. How’s it going? Be careful not to burn it! 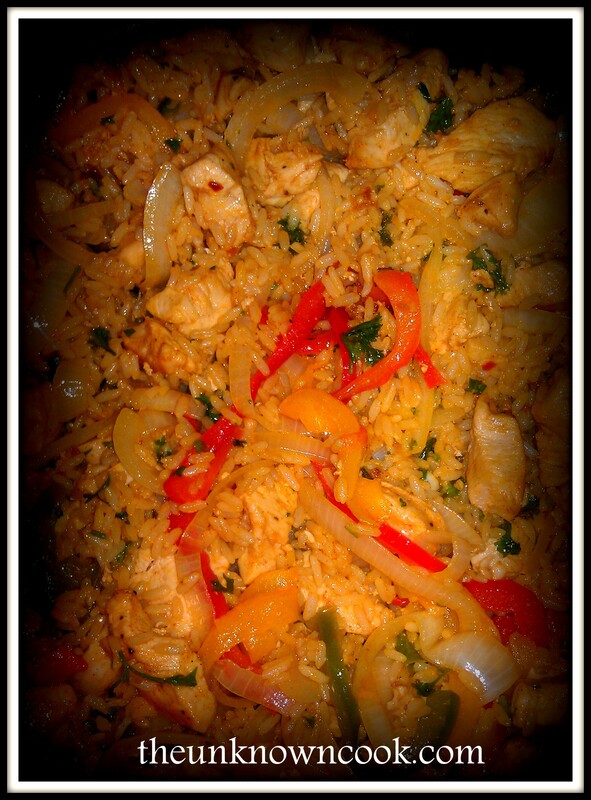 Now that you have the peppers and onions well mixed and cooked to preference, add in that beautiful rice you prepared. The rice will still be a bit warm but if cooked perfectly, will still fall apart as you add it to your mix. Take the last 2-Tbsp of olive oil and add to the mixture. This will help coat the rice and prevent sticking to your skillet as you mix the rice, peppers, and onions together. Let it cook for a little bit turning it moderately. Have you checked your chicken? It should be really close to done by now. Reduce the heat and let it relax for a bit. We have to get busy on something else. In a small sauce pan on medium heat, melt the 1/2 stick of butter. Once it is completely melted, add in the 1/2 cup of flour. This will make the roux for your tomato sauce. The darker the roux, the darker your tomato sauce will be. For the sake of time, I made a blonde roux. I then added the 2-cups tomato sauce, 1/2-cup of water, and 1-Tsp of sugar to the roux. Stir thoroughly to ensure the roux is blended well with the liquid. You may elect to add your own special blend of seasoning to this sauce or add a portion of your chopped parsley. Keep an eye on your sauce and get back to your rice. How’s that going? Add the chopped parsley to your rice and peppers at this point. We are nearing the end of this meal. After the parsley is mix throughout your rice and peppers, add your chicken and mix it evenly. By now, this should be looking really, really good! Turn the heat down on your rice and get ready to build your burritos. Take one of your 4 tortillas and lay it out flat. Add shredded cheddar on the entire tortilla. Definitely get the edges. This will help the tortilla stay closed once you add the filling. As you are facing the tortilla, place your rice and peppers mixture to the left side of the tortilla. Approximately an inch from the left edge will do. Don’t add too much. You may have trouble wrapping if you do. After the mix is on the tortilla, turn the tortilla positioning the rice closest to you. Grab the left and right side of the tortilla and fold inward about an inch. Now from the end closest to you, begin to roll the tortilla forward to encompass all of the rice mixture. The fold should be positioned on the bottom. You may now add your awesome tomato sauce to the top of the burrito or on the side. You may also optionally add it before you fold the burrito. That’s it! Your Cheesy Chicken and Rice Burrito is made. Follow the same procedure for the remaining tortillas. 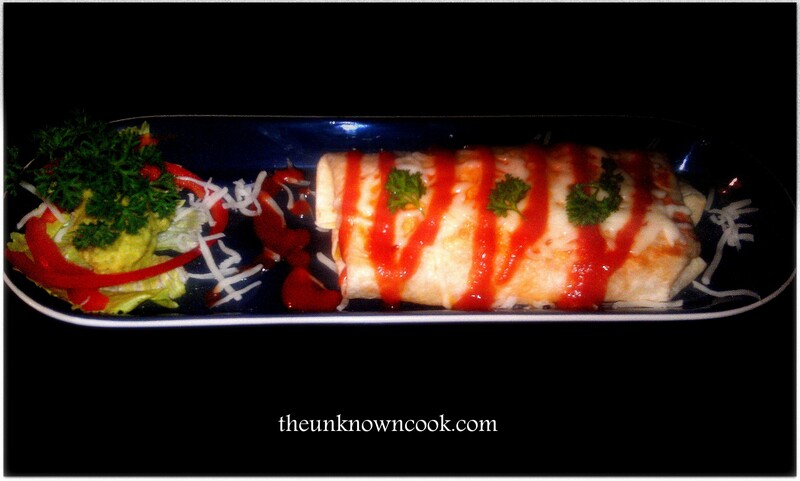 Optionally, you could grill the burrito on both sides and add cheese to the top after the grilling is done. This is the route we went before plating our burritos. There are other great burrito recipes that we found that give you a little more detail and experience with different procedures. We enjoyed this meal and hope that you do too. If you have any questions or suggestions about this recipe, please drop us a line! Posted on September 19, 2014, in Uncategorized and tagged avocado, best burrito recipe, burritos, chicken and rice burrito, chicken and rice recipes, how to make a burrito, mexican cuisine, mexican dishes, Mexican food, quacamole, recipes. Bookmark the permalink. Leave a comment.